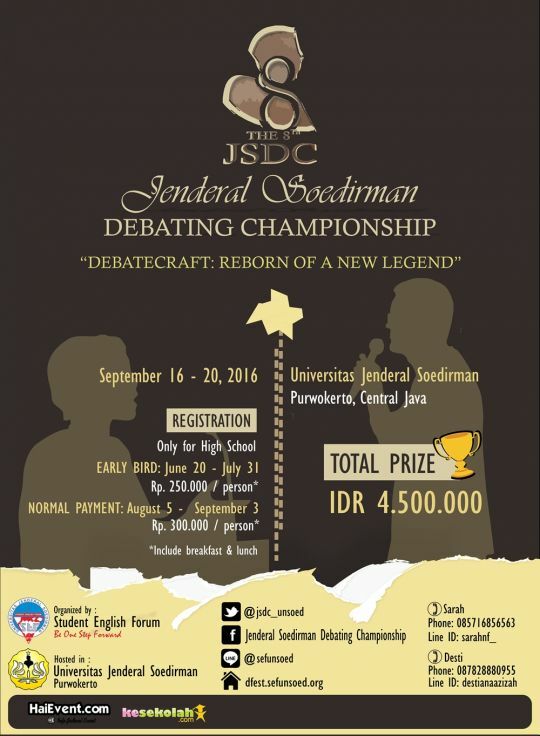 SEF Unsoed proudly presents an annual JENDERAL SOEDIRMAN DEBATING CHAMPIONSHIP (JSDC) 2016. JSDC is one of the biggest debate competition for senior highschool students who are looking for Asian Parliamentary System tournament in Indonesia. This year, The 8th JSDC will be back on September 16-20, 2016 with the theme "Debatecraft: Reborn of A New Legend"
Here are things about this year’s JSDC. Raih Kuliah S2 Pendidikan dan Ilmu Sosial di London Gratis!